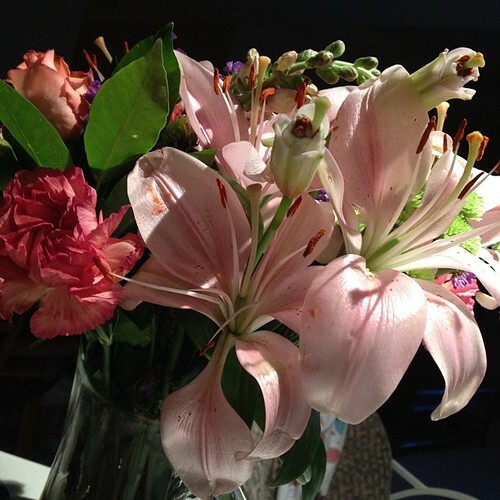 In the predawn darkness of 6 a.m. the kitchen lights leave the lillies he bought me for Valentine's Day aglow. A week later, they've blossomed, bloomed and stretched wide open as we've gone about our everyday life, likely, from the tender care my grandparents have suggested and put forth in cutting the stems and replacing the water and clearing the decaying leaves. As I wipe sleep from my eyes, the flowers whisper of love that transcends time zones and continents and the oceans that are in between my physical heart and my husband's. And, too, they remind me that love in all of it's flourishing beauty, like the lillies, doesn't always just blossom and glow; it's result of the tender care I sometimes brush to the wayside in favor of the immediate demands of life. Today, I decide in the early morning hours of the day, I'll favor the delicate care.